As expected, the long time trial created massive time differences and with Richie Porte out of contention for the overall win, it was always likely that Alberto Contador would use the stage to stamp his authority on the race. He narrowly missed out on a stage win but he will get an immediate chance to make amends in tomorrow’s first stage in the high mountains where he has the chance to emulate the late Marco Pantani who took a huge victory in Madonna di Campiglio in 1999. The climbers were dealt a blow in the time trial but they will be given an immediate chance to strike back in the tough stage 15. After their long journey from the Ligurian coast to the south of the country and back to the north, the riders have finally reached the high mountains where they will spend most of the final part of the race. Their first battle will take place on the climb to Madonna di Campiglio on a day when the Italians will remember the late Marco Pantani who took a memorable stage win there in 2009 before being thrown out of the race due to a high haematocrit level. The stage is 165km long and brings the riders from Marostica to the top of the Madonna di Campiglio climb and is a high mountain stage with a summit finish. The route initially passes through Valdastico, clears the La Fricca KOM climb (category 2, 11.3km, 5.1%, max. 10%) – a gradual climb with a gradient of around 6% in the first part before it levels out near the summit – and then runs down the long descent leading to Trento where it takes in the first kilometres of the Monte Bondone climb where Mikel Landa won a stage at last year’s Giro del Trentino. From here, the route then heads towards Sarche, Terme di Comano and Tione di Trento. With 40 km remaining, the bunch will be confronted with the very challenging Passo Daone climb (category 1, 9.2%, max. 14%) that features an average gradient above 9%, and peaks reaching as high as 14% in the central sector and leaves almost no room for recovery as the gradient barely drops below the 9% mark. This is followed by a difficult descent, on a narrow mountain road with some hairpin bends, and generally steep slopes up to Spiazzo. The route starts to rise again, first with a deceptive false-flat drag up to Pinzolo, then with an average 6% up to the last 3 km, after crossing the urban area of Madonna di Campiglio. Starting in Carisolo, the final climb has a length of 15.5km and an average gradient of 5.9%, with steady gradients of around 6.5% up to Madonna di Campiglio. The route runs across the urban area of the town (with a short setts-paved stretch) where it gets significantly easier with a 3km section of just 2.8%; the highest slopes (12%) are found outside the town. The last 2km run at a 7% gradient on a well-paved asphalt road (with a 5.5m width at the finish), with a short easier section from the 1.5km to 1.0km to go mark. There are two hairpin bends inside the final kilometre, with the final one coming with 500m to go from where the road bends very slightly to the right. The climb has only been used as a stage finish once in the past: in 1999 when Pantani took that memorable win by distancing his main rivals by 1.07. Today was another day in the rain for the riders and as it has been the case for a couple of years now, it seems that they will again have to endure tough conditions in the decisive stages in the mountains. Rain is forecasted for most of next week but there is a solid chance that tomorrow should be a better day.. In the morning, it should be a partly cloudy day but as the day goes on, it will get cloudier and light rain is forecasted for late in the afternoon when the riders approach the finish. However, it won’t be too cold in the mountains as the maximum temperature in Madonna di Campiglio will be around 11 degrees. There will only be a very light wind from a northeasterly direction which means that the riders will mainly have a crosswind from the right for most of the day until they turn into a cross-tailwind at the feed zone. At the top of the climb, they will turn into a cross-headwind. Importantly, there will be a headwind on the final climb until they turn into a cross-tailwind with 2km to go. Alberto Contador was destined to move into the maglia rosa in today’s time trial but the Spaniard did much more than just taking the overall lead. With a dominant ride, he firmly established his position as the strongest rider in the race and now leads the race with a big margin. We have not even had the first big mountain stage yet but the fight for the overall victory already seems to be over. The final week is loaded with tough stages and numerous very difficult climbs but with today’s performance, Contador has proved that he is very close to his best condition. That will make it virtually impossible for anyone in this race to get even close to him in the many battles in the mountains and it seems that only bad luck can prevent Contador from winning the race. That won’t make the race non-exciting. The battle for the remaining spots on the podium is still wide open as the time trial created some surprising results. Richie Porte has clearly cracked and Rigoberto Uran produced a surprisingly poor ride. Instead, Jurgen Van Den Broeck bounced back with another stunning time trial performance while Andrey Amador confirmed his great TT skills and suddenly finds himself in third overall as we approach the final week of a grand tour. Until now, we have had lots of climbing but we have not had a stage in the big mountains yet. Tomorrow it is finally time for the riders to test themselves on the real climbs and we should have another shake-up of the GC and get a much clearer indication of which riders have the recovery and climbing legs to contend for a top 10 result. However, the stage is a good example of the kind of stages that characterize this year’s edition of the Giro d’Italia. When he had had time to study the course, Contador was not too pleased with the design of the mountain stages as they are generally characterized by rather easy finishing climbs. That is also the case for this stage. Passo Daone is a very tough climb and can be used to really do some huge damage. However, the final climb to Madonna di Campiglio is not very hard and it won’t be made any harder by the fact that there will be a headwind. There are no very steep sections where a big difference can be made and after the first 10km, the riders face 2.5km that are almost flat. The final 3km are again a bit steeper but the difference is only made here, we won’t see big time gaps between the favourites. This means that the race has to be made hard already on the Passo Daone if one really wants to make a difference. However, if a strong team makes the race explode to pieces on those steep slopes, there will be a lot of tired legs by the time they get to the final climb. It may still be hard to make a big difference but it should be possible to open some gaps in the final steeper section in the tailwind. Despite the nature of the final climb, it should be more about climbing skills that explosiveness if someone really takes the bull by the horns on the Passo Daone and it is hard to imagine that it won’t be the case. Much will depend on the tactics of Astana and Tinkoff-Saxo. A breakaway always has a big chance in this kind of mountain stage and tomorrow the escapees may again ran away with the stage victory. However, Alberto Contador still hasn’t won a stage in this race and there is no doubt that he wants to take a victory at some point. He has lots of opportunities in the third week and he may not be willing to use too much energy to bring back an early break at this point in the race. Fabio Aru bounced back with a solid time trial performance and he seems to have put an end to the trend of a slump in form. However, he knows that it will be very hard to win the race overall. Will he still be aiming at the overall victory or will he focus on a possible stage win and defending his second place? In any case, there is no doubt that Astana will use their strong team to put Tinkoff-Saxo and Contador under pressure. They want to have a rider in the early break and Tinkoff-Saxo will do their utmost to make sure that they fail in that mission. This should set the scene for a fast an aggressive start and as usual it will take a long time for the break to get clear. There is a big chance that the break won’t have taken off by the time we get to the first climb and if that’s the case, we should see a big and strong group get clear. In such a scenario, the break will have a very good chance. Very early it will be clear whether Contador wants to win the stage. If he keeps the break at a tight leash, he is aiming for the victory but it is definitely also possible that he lets the gap grown too much. If that’s the case, it will be left to Astana to keep the situation under control as no other team can realistically aim for a stage win in a battle between the favourites. The key point is the Passo Daone. There is no doubt that Astana want to isolate Contador and they have a good chance to do so. This climbs is so hard that only the very best will be left by the time they get to the summit and with Roman Kreuziger being far from his best, Contador could find himself on his own when they get to the summit. If Astana really go full gas here, it will be hard for the break to make it to the finish. If Contador is isolated, Astana will go nuts on the final climb by sending riders on the attack. However, Contador doesn’t really need to mark other riders than Aru but on a pretty easy climb with a headwind, it may be difficult for the Spaniard to keep the situation under control. He is unlikely to lose time to Aru in the overall standings but he may have to allow another rider to ride away with the stage win. Nonetheless, we will put Contador on top of our list of favourites. The Spaniard is clearly in a class of his own and even though he may find himself in a difficult tactical situation, he can just let the legs do the talking. If he goes full gas on the final climb, no one will be able to follow him. On paper, Contador was always the best climber in the race but until now he has been riding very conservatively. He has only tested his rivals on select occasions with small attacks in terrain where it was always impossible for him to make a difference. With his big goal of the Giro-Tour double, he was clearly not at 100% at the start of the race and his injury hasn’t made it any easier. However, he is obviously on the rise and his ability to recover this late in a grand tour is excellent. What really shows that he is getting close to his best is his performance on the Monte Berico. That climb was way too explosive for Contador so for him to finish second, beating several specialists, prove that he is getting close to his bets. The only rider that may be strong enough to follow him was probably Richie Porte but the Australian seems to have cracked. He still hasn’t won a stage in this race and he would love to get that issue out of the way before we get into the third week. 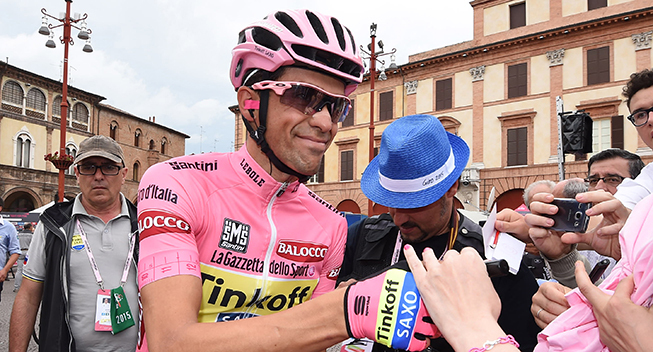 There is no doubt that Contador will be the man to beat. It has always been clear that Mikel Landa is an outstanding climber but this race has really been a big breakthrough for him. He has been able to match Contador, Porte and Aru on a number of occasions and Porte has even hinted that the Basque looked like the strongest rider in the race. He got close to a stage win on Campitello Matese and he would love to make up for that disappointment. If Contador is isolated, Astana will definitely try to send Landa up the road and as he lost a big amount of time in the time trial, Contador doesn’t need to react. It is hard to imagine that anyone will be able to go with the in-form Basque and he could easily end up taking another stage win for Astana. The second rider that Astana can send up the road is Tanel Kangert. The Astana rider was unstoppable in stage 12 and he confirmed his good condition in today’s time trial. This kind of climb suits him really well and as he is not in GC contention, Contador won’t be too bothered if he attacks. This will also allow him to attack early in the stage and if he makes it into the right group, he will be very hard to beat. Of course Fabio Aru will also be in with a chance. The Italian seemed to be fading but his time trial performance suggests that he is still riding strongly. In fact, he has always been slightly inconsistent in grand tours and so it is not a very big surprise that he has had a few bad days. However, he will be closely marked by Contador and there is no way that he will be able to drop the Spaniard. His only chance is to glue himself onto Contador’s wheel. If he is still there with 500m to go, he may use his explosiveness to take a stage win. There is a solid group of GC contenders who will be ready to join the Astana riders when they go on the attack. Damiano Caruso will have the best chances. The Italian joined BMC to get the chance to lead a team in a grand tour and he earned himself a spot at the helm by finishing in the top 10 at last year’s Vuelta. That performance marked somewhat of a comeback for the talented Italian who gave lofty promises in his first years as a professional but suddenly saw his progress stall. In this race he has been riding rather anonymously but he has been the most consistent rider just below the best. Furthermore, his condition seems to be growing as he looked very strong in stage 12 where he played a key role in supporting Philippe Gilbert. Finally, he has a very fast sprint which will allow him to finish it off in an uphill sprint if he escapes with one or two riders for company. Ion Izagirre was keen to test himself as a grand tour contender in this race but until now the race has not gone according to plan. He suffered in the heat in the first part of the race and he lost another big chunk of time in the crash-marred stage 13. However, he has been riding very strongly in recent stages and he seems to be getting better and better. The high mountains is a bit of an untested territory for the Basque but he has the advantage of being a little behind on GC and so he won’t be too heavily marked. He can both attack early or late in the stage and he has the form to finish it off. The first part of the Giro has been a strange one for Jurgen Van Den Broeck who is usually very consistent in grand tours. The Belgian looked strong in the first hilly stages but then had a slump in form. However, he seems to be getting better and it was a clear indication of good form that he finished in the top 10 on the Monte Berico whose explosive nature didn’t suit him. Today he confirmed the impression with his great time trial and he is now back in podium contention. This could make Going into the race, he was marked out as a podium contender but he has already lost quite a bit of time. This may make a bit too heavily marked but as Contador won’t be too concerned with him, he will have a chance. Leopold König is now the Sky captain and his time trial performance confirms that he is riding very well. He has often been on the attack in grand tour mountain stages and he knows how to grab his chances. In that way, he won a stage in the 2013 Vuelta and got close in the 2014 Tour. He has lost a bit of time in GC and so he won’t be too heavily marked. We won’t completely rule out that Richie Porte can bounce back with a great ride. The Australian seems to have cracked mentally and he has never been very good at bouncing back from adversary. His form seems to be getting worse after a hard spring. On the other hand, he was riding outstandingly well in the first week and if he still has those legs, he can do big things both on the final climb or by going on the attack. If a breakaway makes it to the finish, Benat Intxausti must be the prime pick. The Basque had hoped to do well in GC but the cold weather in the beginning of the race took him out of contention. Since then he has bounced back with a stage win and he is now firmly in contention for the mountains jersey. Tomorrow will be a good day to pick up more points and Intxausti is strong enough to also take a stage win. He has been at ease climbing alongside the favourites in the last few stages and there is no doubt that he is one of the strongest riders in the race. In our pre-race previews, we said that Carlos Betancur would be absolutely flying in the final week of the race where he could very well win a couple of stages. He is not there yet but he is getting close. He may not have been strong enough to turn his aggressive riding into a stage win but it speaks volumes about his form that he has been in the right break in all the hilly stages since stage 8. There is no doubt that Betancur’s condition is growing with each passing stage and it is just a question of time before it comes together for the Colombian. After his excellent performance in Romandie, Ilnur Zakarin was off the pace in the first part of the Giro. However, he has ridden himself into good form as he proved with his stunning performance in stage 11 where he was clearly the strongest in a break royale. He has proved that he excels in rainy conditions and if he still has those legs, he will be hard to hold back. He still needs to prove that he can recover in the third week of a grand tour but here is no reason to suggest that he can’t. Darwin Atapuma has been playing the GC game until now but after the crash in stage 13 and the time trial he has now lost a lot of time. He still has the goal of winning a stage and he should now have the freedom to go on the attack. He has never been climbing at such a high level before and these long climbs should be right up his alley to make it into an early break. Giovanni Visconti has faced some criticism from Italian journalists who have questioned his strategy of staying in GC contention. That has made it impossible for him to go on the attacks in the hilly stages that have suited him down to the ground. However, Visconti has lost a lot of weight and says that he has always had his eyes on the big mountain stages after the time trial where he has been convinced that he would have lost enough time. He may still be a bit too close for the GC riders to be comfortable with his presence in an escape but it is time for the in-form Italian to go on the attack. Ryder Hesjedal has been riding very aggressively in this race and he has hit the right break on two occasions. Always doing a lot of work, he has missed the last little bit to finish it off. However, he should be more comfortable on the long, really hard days and tomorrow could be a good day for him. He is far enough down in GC and everybody knows that he only gets better in the third week of a grand tour. Steven Kruijswijk has been amazingly strong in this race but his many heroics have been unrewarded. However, we are now getting into the terrain that really suits him and he should have a better chance of finishing it off. His time trial proves that he is in excellent condition. He still hopes to win the mountains jersey and to do so he needs some big breaks in the mountains. Tomorrow’s stage will be a good opportunity for him. Mikel Nieve is a master in going on long-distance attacks in the mountains and now he has the freedom to do so. He doesn’t seem to be at his highest level at the moment but he is not too far away. He did a good time trial which suggests that he is getting better and on paper he is one of the best climbers in the race. Finally, Stefano Pirazzi deserves a mention. The Bardiani rider has really been climbing well in this race but his attacking has been unrewarded. In fact, he has not hit a single break yet which must be hugely frustrating for a rider who is riding so well that he has been able to stay with the GC riders for a long time. It is time for Pirazzi to finally benefit from his form and if he makes it into the right break, he will be one of the favourites.